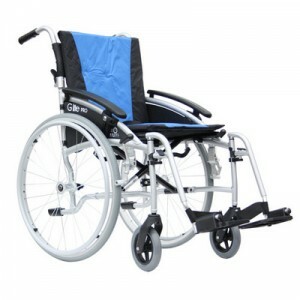 Our best selling wheelchair the Excel Glite Pro Self Propelled Wheelchair, a wheelchair recently upgraded from the old Excel Glite Plus version with new and exciting features. The main improvement is the introduction of the sloped height adjustable armrests, this gives the user more say on the height or there armrest, with a simple push button system to adjust to any level, this will also now enable you to go safety under a table whilst still in your wheelchair, without your armrests becoming a hindrance. Whilst keeping its sleek design the Excel Glite Pro Self Propelled wheelchair with its padded seat and padded back which comes as standard when you order it, it now offers solid front and rear tyres so no more punctures. All in all the Excel Glite Pro Self Propelled Wheelchairs has everything that a user will need for a comfortable trip out, with its unique styling it sets it out above the rest and moves away for the bog standard look of a wheelchair.